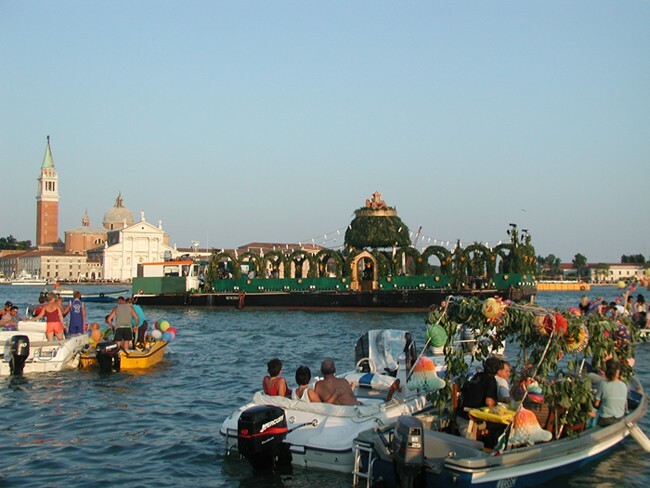 The Redentore (Reedemer) festival is the oldest continuously celebrated date on the Venetian calendar. The Redeemer’s Festival is celebrated every year in Venice on the third weekend in July and has always been deeply felt by all Venetians and consequently by tourists participating in thousands to this great event. Each family begins preparations as early as Friday, decorating its own boat with festoons and colored lamps and preparing an extensive menu. The lucky ones who live at Giudecca have the privilege of a direct view on the Saturday evening Show and are used to set their tables directly in the “fondamenta”. Other Venetians prefer to celebrate on their terrace or roof terrace, also festively decorated, from where they can enjoy the show after eating a hearty dinner with friends. The typical dishes of the evening are: “Sarde in Saor” (sweet and sour sardine), “Anatra Muta Ripiena” (roasted stuffed duck), “white beans with onion”, watermelon, some cakes, and of course a lot of wine, to pull up late with dancing, singing and having fun. Obviously everyone prepares the menu closer to their tastes or simply, more easily transportable by boat. Finally, in the early evening, boats of every shape and size gather in the lagoon between St. Mark’s, San Giorgio, the Punta della Dogana and the Giudecca, each holding local families supplied with food, drinks, music, laughter, shouting and a great desire to have fun. 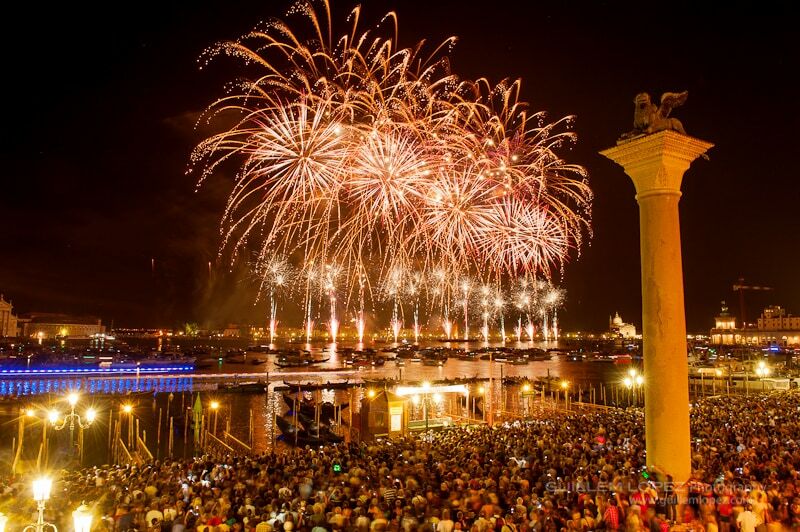 The party carries on through the evening, culminating in an amazing fireworks display. At 11:30 PM everybody face-up! Fireworks start! 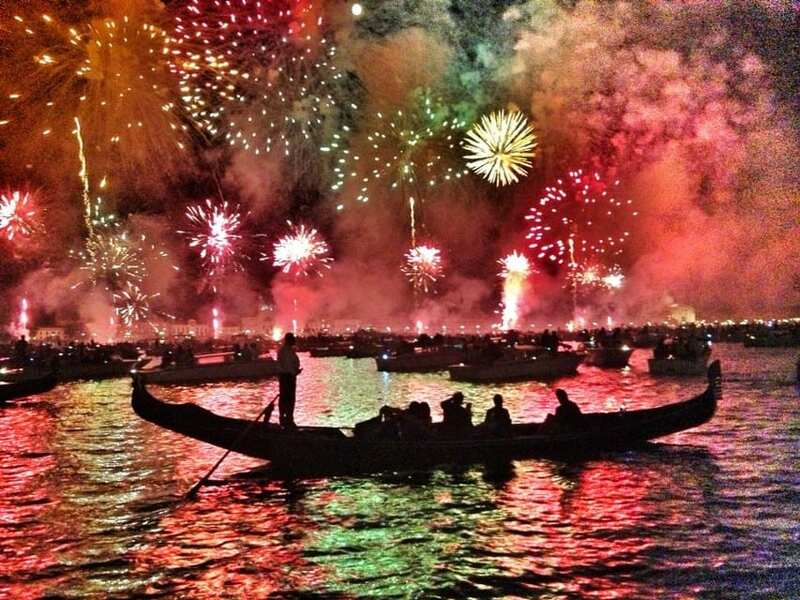 They are fired from floating docks, lighting up and coloring up the Bacino San Marco, St. Mark’s square, the Doge’s Palace, the Basilica della Salute and the Riva degli Schiavoni. It’s a unique show, in a unique scenery. 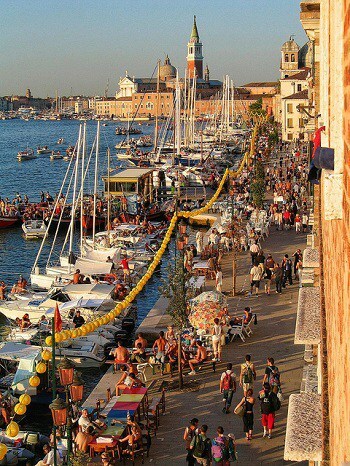 On Sunday, the festival ends with a Regatta, which takes place in the Canale of Giudecca , starting and finishing in front of the Church of the Redeemer. The origin of this festival dates back to 1576. 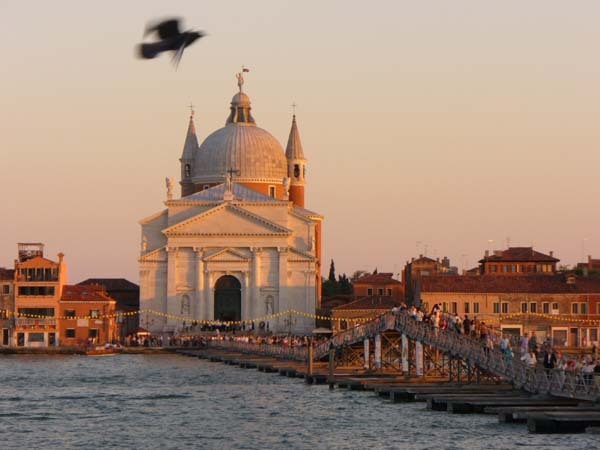 At the end of a plague epidemic, the city celebrated her deliverance by commissioning Andrea Palladio to build a church on the Giudecca, to be known as “Il Redentore” – The Redeemer. Every July a pontoon bridge is built across the canal that separates the Giudecca from Venice proper, so people can make the pilgrimage to the church on foot. In Venice, we have been celebrating the Festival of Redeemer for centuries, so save the date, because this year you cannot miss!